The Co-operative Group has decided to continue financially supporting the Co-operative Party, which has strong ties to Labour. Members of the group, the UK's biggest mutual organisation, voted on the issue at their annual general meeting. They passed a motion by 48,579 for, to 39,479 against, to approve "political expenditures" of up to £1m which support the movement's objectives. Last year the Co-op Group gave £625,000 to the Co-op Party. This figure was down on the sums donated in previous years. The AGM also included a vote on new corporate governance procedures which would mean members having less of a direct say. 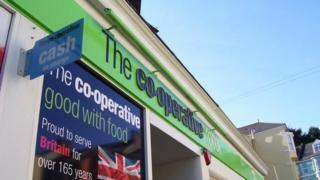 The Co-operative Group is still recovering from a period of financial mismanagement and some members have recently expressed concerns about how elections to the board are chosen. The banking arm of the group came close to collapse in 2013, bringing the whole group to a £2.5bn annual loss that year. The Co-op Party includes among its members a number of Labour MPs, including shadow chancellor Chris Leslie and Walthamstow MP Stella Creasy. The politicians stand as candidates of both the Co-operative Party and the Labour Party, and the two political movements have strong historical ties. The board asked the members of the Co-operative Group whether they wanted to continue financially supporting the Co-operative Party, or any other party. Allan Leighton, chairman of the Co-op Group, said: "There's a clear remit from the members to continue to support the Labour Party. "It allows us to now have a conversation with the Co-op Labour Party about what we do next." There was also a members' motion on the agenda, put forward by those in favour of making political donations of up to £1m a year. The motion to approve political funding "not to exceed £1m per annum" was carried by 55.17% to 44.83%. BBC business correspondent Joe Lynam said: "To meet a £1.5bn hole in its accounts - mostly stemming from its banking division - the Co-op Group has had to sell off parts of its businesses and hand over majority control of its bank to American hedge funds. "It's also in the process of radically changing the way it runs itself into a more corporate structure with less of a direct say by its members." He said that "in theory", each of the 2.8 million Co-op members could vote on a series of motions about the reforms, as well as how its bosses are paid, and retaining the links to the Co-operative party. One of the group's largest independent societies, Midcounties, recently threatened legal action over a shortlist of six candidates for the group's board being reduced to three - the number of positions available - before a member vote.